Cultivating and challenging engaged, "future-ready" learners in grades 6 - 8. In a respectful environment that’s sensitive to the dramatic changes children experience during early adolescence, Park City Day School students develop leadership skills and learn to make responsible choices, both academically and socially. The Middle School Program offers a challenging curriculum that is a solid preparation for academic success in high school and beyond. Our experienced middle level educators mentor as well as teach, and through frequent personal interaction and an advisory program, they encourage students to navigate the challenges of adolescence in healthy and positive ways. Through these close, nurturing relationships, we help to shape our students into the positive adults they will become and help prepare them for their future - one we cannot fully imagine today. A typical day in the classroom involves hands-on, experiential learning, and integrated technology utilized to help students develop the knowledge and skills necessary for success. The advanced, researched-based curriculum, the project-oriented, experiential learning environment, and the intellectual example displayed by exceptional teachers foster in our students a habit for lifelong, engaged learning. Students participate in visual arts, outdoor learning, service learning, student government, and explore a variety of elective courses that help them to grow as individuals within peer groups that are supportive and encouraging of that developing individuality. 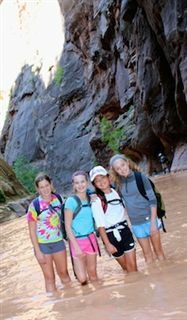 PCDS middle school students discover a true sense of connectedness and a place to belong. Middle school students don’t just learn from books, they learn from experience. Whether its hiking slot canyons in the southern Utah desert or exploring local nature preserves, each excursion is an opportunity for authentic, real-world learning. Meet the MS faculty.